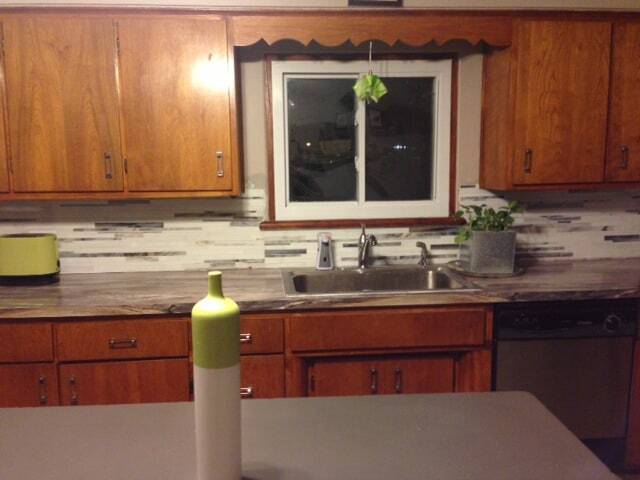 I spent my WHOLE 3-day MLK weekend tiling my kitchen backsplash! I’ve had the tile since October of last year, so I was so excited to actually take it out of the box and get it on the wall! 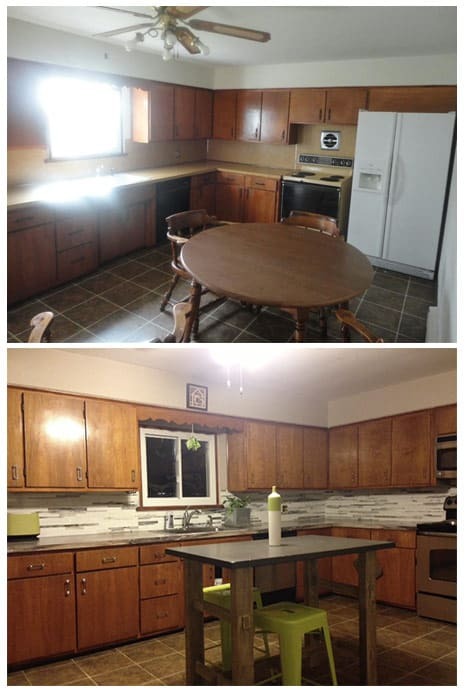 Once the countertop was reinstalled, I immediately pulled the my tile out and could not wait to get started! 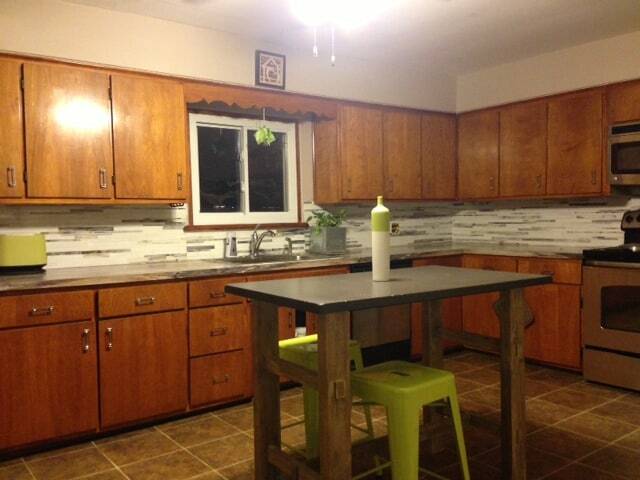 Here is the tile inspiration I pinned 42 weeks prior to this post. I fell in love with my backsplash tile 42 weeks ago according to my Pinterest account (it’s the 3rd to last pin on the board). Unfortunately, by the time I was ready to actually purchase tile, the URL that I pinned it from had broken. I really had no way of knowing where this tile came from, how much it was, or how to purchase it. I searched for weeks and weeks on blogs like houzz.com, and googling random keywords that might get a hit. Eventually I found it — Mixed-Up Mosaics. I quickly e-mailed Lesley the photo and asked if they could still produce this design. She said they could, and was a joy to work with — taking my budget into consideration, sending me samples, and working with me to produce the perfect ratio of white glass to marbled glass. It was an unbelievable experience and I have zero regret about the hours I’ve spent searching for this tile. Totally worth it. 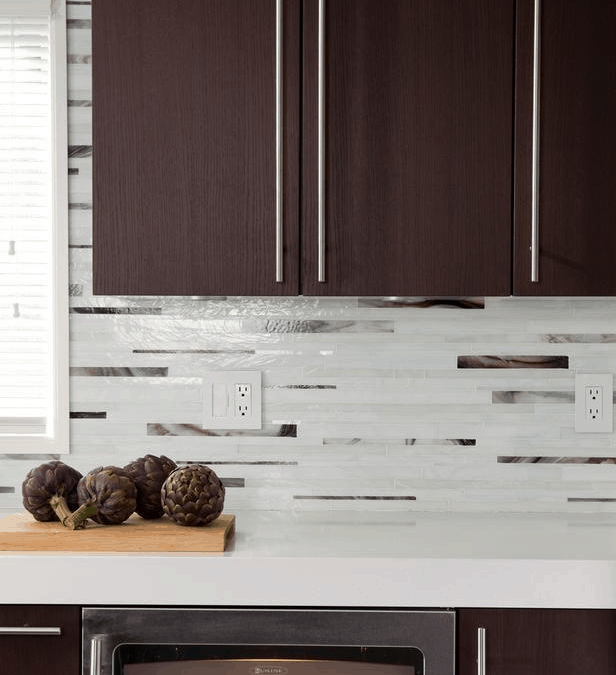 The first step to installing a tile backsplash is to measure the space you have and convert that into square feet. You do this by measuring each section’s length and height, and multiplying them together. 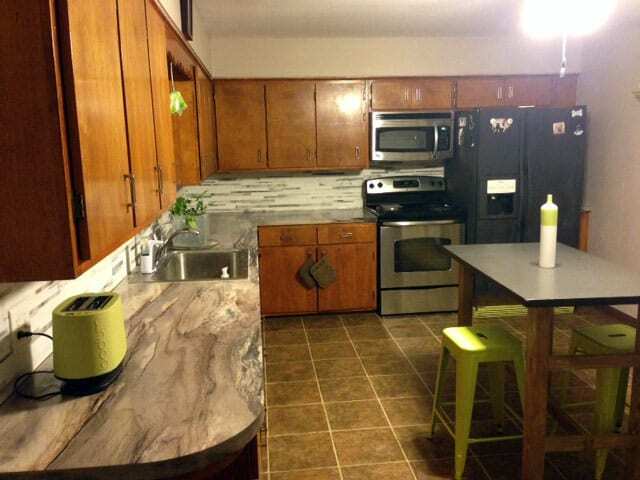 So if you have a counter that’s 6′ long and 18″ high (1.5′), you will need 9 square feet of tile. A rule of thumb is to get an extra 10% (in case some of the tiles are broken, or get damaged when making cuts), so in this case I would recommend getting about 10 square feet. Mixed up Mosaics does things a little differently. 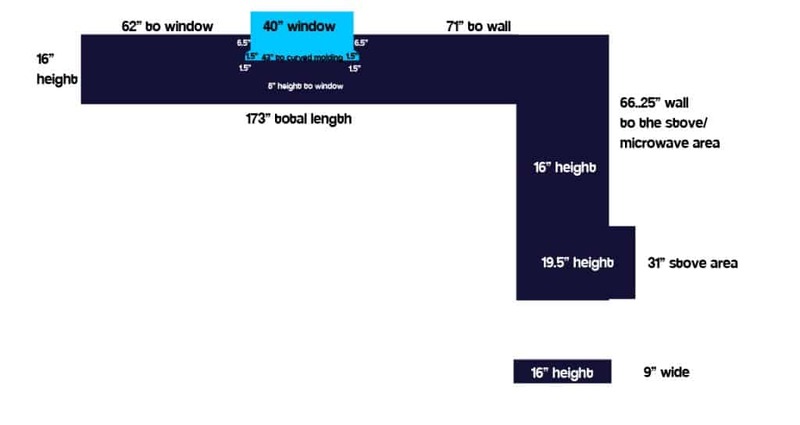 They had me make a drawing of the absolute EXACT measurements of my backsplash area — including where cuts around windows and cabinets were. I e- mailed my drawing to Lesley and then waited about 2 weeks for them to actually custom make my mosaic. Here is the exact measurement drawing I sent to Mixed Up Mosaics. The mosaic tile I chose is made up of all different shapes and sized tiles. They custom cut it to fit into my space, and hand place each tile where it looks best. Once they have it cut to size and lined up, they cover the entire FRONT of the tile with what’s called tile tape. 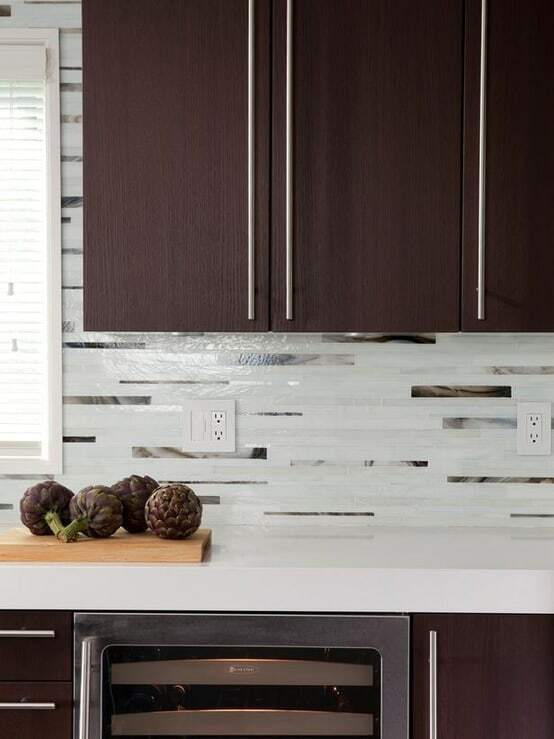 This is different from the tile mesh backing you would find if you bought a mosaic tile in the store, because first it goes on the front of the tile, and secondly, after the installation it gets removed. 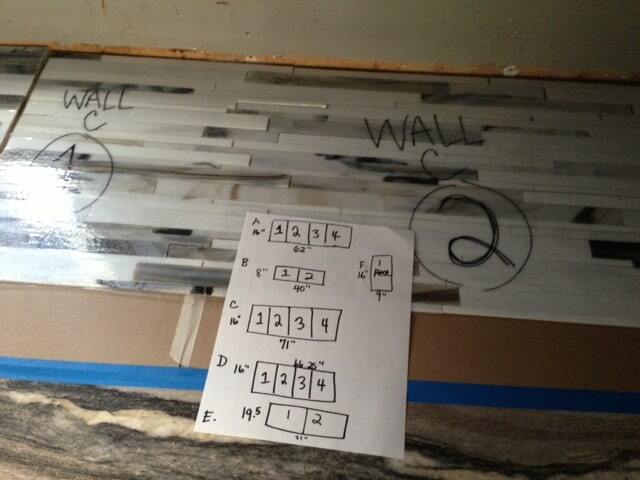 Here is my “tile grid” along with some of the tile with the tape on it marking where on the grid it will be placed. The process for putting the tile on the wall was really easy. Since the front of the tile is covered in tape, they were able to write on the tape using a sharpie to note which piece would go where. I covered the new countertop with some cardboard and taped it down with painters tape before I got started. Then, I carefully removed the tile pieces from the boxes and laid them out in the correct order. It was easy to tell where each piece would go because they were all labeled, and Lesley also sent me a “tile grid” drawing to show exactly how they would connect together. The process for installing the tile was exactly the same as any other tile project – tile adhesive troweled on the wall, push the tile in, let it dry. On my drawing to Lesley, I did not include the two outlets that are on my wall. I was too worried about the placement of these lining up, so I thought I could cut them myself. Thankfully, the very fragile tile cut nicely with the tile saw, and I really had no problems making any adjustments to accommodate the outlets. 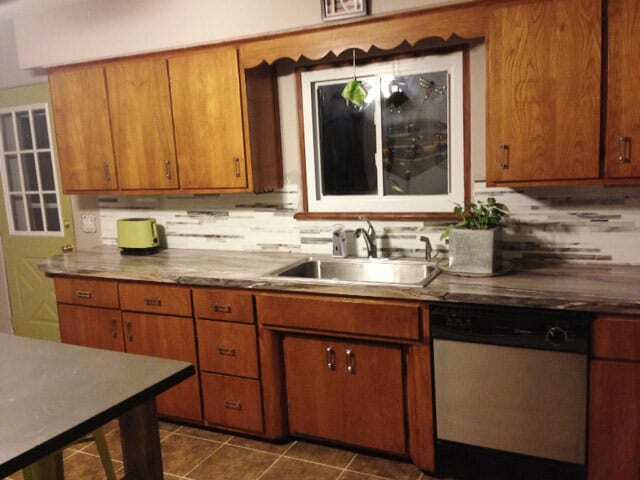 There was also one length of tile that was about 2″ too short, so I ended up stealing some tile that would have been covered by the stove, and cut 2″ little strips and retrofitted them into the design. This was a lot of work, but it was well worth it — because of the nature of the tile and it’s very random pattern, sticking a 2″ slice at the end would have been a huge eyesore. By taking my time and making the 20 or so extra cuts, it blends right in like it never happened! I waited for the tile to dry for a day and a half, then carefully removed the tile tape from the front of the tile. This was a difficult process, because the clear tape blends in very well with the white tile. It’s also nerve-wracking because you don’t want to pull any of the tiles off the wall in the process. The long, tedious process took me a few hours, and then I began to grout. Typically with grout joints this small you would use an unsanded grout, however, with this particular tile I was given explicit instructions to use white sanded grout only. It’s important to always follow directions if you are ordering something custom. After the grout was hazed over, I carefully rubbed the entire backsplash with a clean wet sponge to remove any of the excess grout. I put the outlet covers back on, installed the sink, and voila! My backsplash is about 32 square feet. Mixed Up Mosaics quoted this tile at $65/square foot. She did work within my budget but I’d rather not give the actual price I paid.